Everybody knows that behind every great man, there is a great woman. Even behind the beloved Santa Clause, there stands the gracious and beautiful Mrs. Clause! Now you can be a picturesque portrayal of this wonderful woman for Halloween, during the Christmas season, or just any day you feel a rush of holiday cheer. Toss on this lovely floor-length red dress, tie up your apron, and top this outfit off with the included matching mop cap, and you’ll look just like ole Saint Nick’s number one gal! Hopefully, you’ve perfected your gingerbread man cookie recipe because everybody knows Mrs. Clause makes the BEST gingerbread man cookies. So, no pressure. Have a friend or your significant other dress up as Santa and the two of you can prance around as the jolliest couple this side of the North Pole. We just know that you two will have oodles of fun while putting smiles on children all around your neighborhood! All you need to complete this classic Christmas look is a few accessories. Grab a white wig to give yourself an enchanting elderly look and maybe even toss on a pair of wire framed glasses. You’ll look as if you walked right off the pages of a Christmas storybook! Grab this Mrs. Clause Costume and look through our Christmas themed accessories to prepare for the merriest Christmas season you've ever celebrated. This transformation will put a smile on your face and the face of every child you meet! I loved this costume. It fit well,the fabric was comfortable, and for once it was long enough for me, I'm 5'10". I got so many compliments at our Christmas party. I can't wait to be Mrs. Claus again next year! The outfit fit plus size very well, great for 22w-24w. 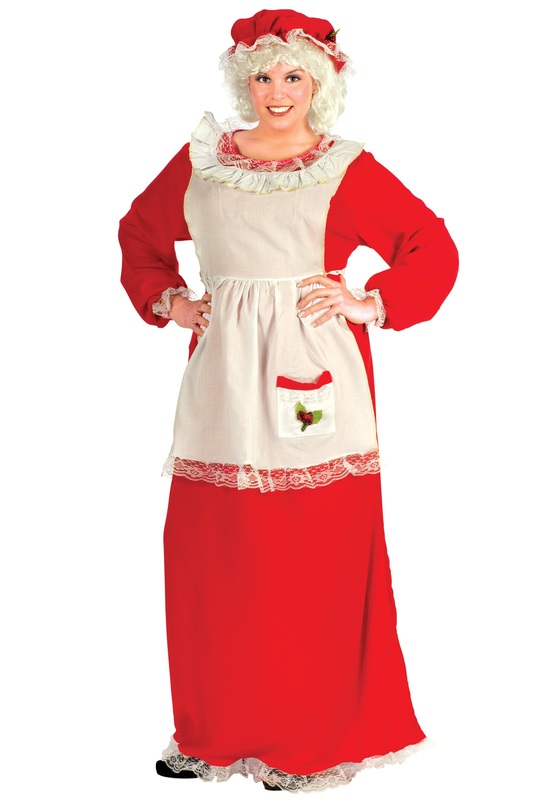 As I know most Santa related costumes are designed for warmth and outdoor use, if you intend to wear this inside, please know it's very warm and has a little weight to it. Other than that it's a great buy on this costume. Very nice quality and it fits this size 22/24, 5’9” tall woman... even the length is great! My only complaint is the amount of wrinkles from the packaging and the fact that it cannot be ironed.